With Queen of Shadows, Sarah J. Maas delivers the best, most exciting installment yet in the much-loved Throne of Glass series. Each page teems with fierce intensity, romantic tension and propulsive suspense as power, magic and evil surge in this high-stakes saga. Reading 645 pages has never been so fun, so thrilling and so entirely satisfying with Maas’ vivid world, multidimensional characters and intricate plotting making the book impossible to put down. Aelin Galathynius has finally embraced her destiny. Now, she fights to free those she loves from the brutal clutches of the evil King of Adarlan. She fights to light up the shadows that for 10 years have enslaved her people. And she fights to reclaim her throne as Queen of Terrasen. And once again, our lethal and fiery heroine does not disappoint. As we’ve come to expect, her cunning mind and physical prowess dominate, but her growing maturity is evidenced throughout in her thoughts and decisions and as she faces the ghosts of her past. Back at Rifthold, however, retribution and scheming go hand in hand, as she pays a visit to her old master, the ruthless King of the Assassins, Arobynn Hamel. In order to save Prince Dorian from the grasp of his deviant father, she must outwit the man who taught her everything. In addition, evil forces amass while swords clash and shadows dance menacingly in the streets around her. Meanwhile, in Morath, Wing Leader Manon tries to uncover the nefarious plans of Duke Perrington while intensifying dissention unsettles the mighty cavalry of witches — the feared Thirteen. Plot points begin to converge and twine excitingly the more we near to the story’s emotional conclusion. We of course see a lot of the powerful Fae prince Rowan, as well as the tortured and capable Chaol, who continues to struggle with his ever-shifting reality. Throughout the course of the novel, however, there is significant and satisfying character growth. Aelin’s romantic entanglements indeed straighten out, as her feelings for both Rowan and Chaol become clear. Maas handles this delicate situation expertly, and I believe that both Team Chaol and Team Rowan readers will delight at the turn of events by the story’s end. 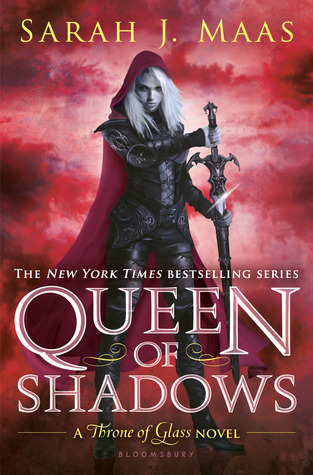 Queen of Shadows is also perhaps the most evocative book to date in the series, with poignant moments between characters (old and new), as Maas explores the fragile and complicated bonds between friends, lovers, allies and enemies. More than anything, this latest release is intensely addictive and mesmeric, with lots of surprises that will leave readers hungry for more. Lucky for us, two more books await before Aelin Ashryver Galathynius’ epic adventure comes to an end.